Other subjects covered for each country include pollution control legislation, nature and conservation management, zoning and land-use planning, liability questions, and judicial remedies. In addition, international monographs cover international legislation and treaties and the environmental legislation of the European Economic Community. Radiation and Vibrations (Nuclear and Non-Nuclear). Index. Current Contents FRONT MATTER: International Advisory Board; Encyclopaedias and Editors; Introducing the International Encyclopaedia of Laws; Curriculum Vitae of the General Editor. 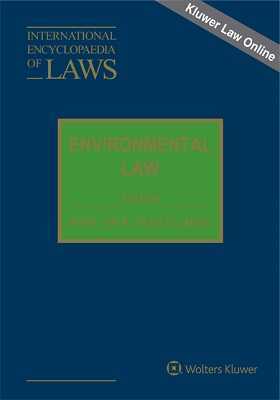 GENERAL SECTION: List of Contributors; Introducing the International Encyclopaedia of Environmental Law; Curriculum Vitae of the Editor; Curriculum Vitae of the Editor’s Assistant.